Thousands of young people erected barricades and blocked traffic in the Guinean capital Conakry on Monday with markets and schools shut as mass strikes gripped the city. Conakry's biggest market, Madina, failed to open its doors along with the vast majority of businesses, as youths overturned bins and set tyres on fire, cutting off entire sections of the city to vehicles. Police made 15 arrests in the Kaloum district, where civil society groups were protesting against the two-week closure of schools. An on-off teachers' strike that has paralysed the education system shows no signs of stopping despite a government offer at the weekend to increase pay. 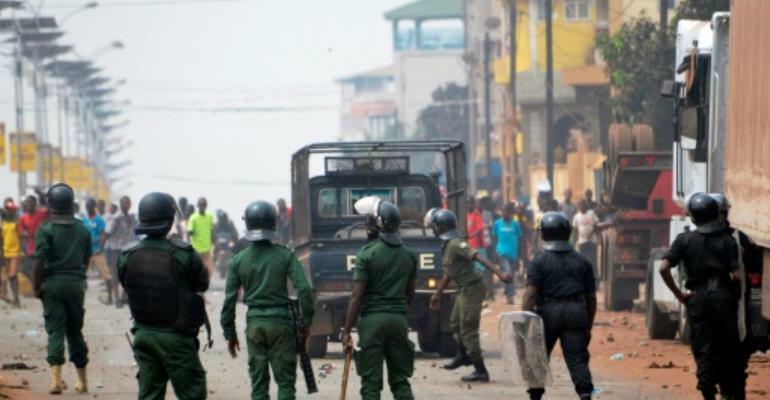 Former prime minister Cellou Dalein Diallo's Union of Democratic Forces of Guinea (UFDG) saw a strong response to its call for a "ville morte" or "dead city" protest, demanding that all economic activity cease and people stay inside. The victory of President Alpha Conde's ruling Rally for the Guinean People (RPG) in the February 4 vote was marred by post-electoral violence involving supporters of the losing parties. An opposition figure told AFP on Monday they were "celebrating the success" of the protest movement, adding that "the next few days will be even harder for those in power, which already has a hot potato in its hands over the results". The government urged teachers who have held various walkouts since December to head back to class on Monday and end their most recent strike, a demand they have flatly refused despite the offer of a 10 percent pay increase over the weekend.